Items arrived earlier than stated. Hard to reach someone technical for a call back. Generally a useful website and good prices. Swimming Pool heat pumps are a great way to heat your pool from solar PV. The heat pump moves heat from the surrounding air into the water, it uses around 20-25% of the energy than if you were heating the water directly. So a 5Kw heat pump is using only 1.1Kw of power to get 5Kw of heat. These units can be easily installed inside or outside. This Dream Swimming Pool Heat Pump is extremely efficient and economical and is a very environmentally friendly way of heating your swimming pool. The energy is collected from the air outside and then transferred to the water in the swimming pool using the same technology that is used in air conditioning units and fridges. For each single KW used by the Dream Heat Pump, between 4 - 5 KW are returned back to the pool as heat. Air source heat pumps are a very cost effective way of providing heating because of the high efficiency of the units, the output heat energy is up to 6 times the electrical input power, this is not possible with other means of gas or oil heating. The Dream Swimming Pool Heat Pump can be installed indoors or outdoors. The unit will even work in temperatures as low as -15°C. The Dream Swimming Pool Heat Pump has no harmful effect to the ozone layer. A Dream Swimming Pool Heat Pump can save you up to 80% in operating costs compared to other forms of pool heating. They are suitable for salt water, chlorinated and brominated swimming pools and Koi Ponds. This outstanding 5KW Swimming Pool Heat Pump offers you a very unique Full Digital Control System plus many more features!!! Every unit has an adjustable automatic defrost cycle. The heat pump requires almost no maintenance. The Dream Heat Pump has no potential for any dangerous fumes like carbon monoxide as there is nothing being burned by the heat pump. The unit is very safe to use. There is minimal installation required to install this Dream Heat Pump. 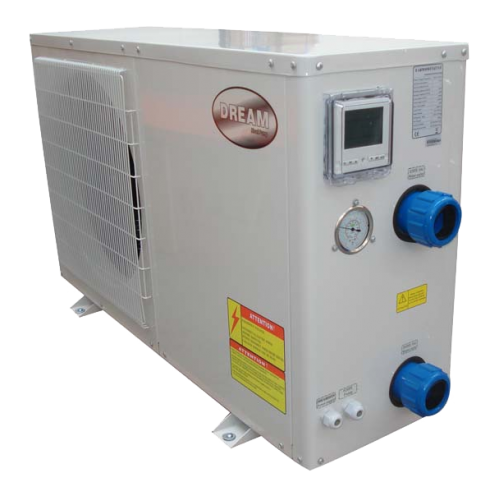 This Dream Swimming Pool Heat Pump has been carefully manufactured to ensure the customer does not have to spend many hours installing the item. The Dream Swimming Pool Heat Pump is fully CE certified. The life expectancy of a Dream Air Source Heat Pump is around 20 years. If you have a solar system, wind turbine or a hydro turbine that produces enough electricity to run your heat pump then your running costs and carbon footprint will be zero.